It is not every day an e-mail reaches me personally from an artist asking me to listen to his or her music and certainly not from Ireland addressed in my own language. It happened recently. So despite having heaps of new records lying about, I decided to set aside time to listen to the mini album from late fall 2018. Jane Willow is a Dutch folk artist, singer-songwriter who moved to Ireland to pursue a career in music. Her first record shows that the move may have been a smart one. It may sound authentic and all, but that is not something that is extremely appealing to me. No, I simply like what I am hearing. Willow manages to produce music that is warm and invites its listeners to change to a different mood and time frame. Ones that allow the music of Jane Willow to enter my mind and go about its business there. Of course an album by a debuting artist begs comparing. What I noticed is a hint of the way Alanis Morissette used to phrase her vocals in the first song, there is a little Damien Rice in a slow song like 'On My Mind'. It is not of much use to continue. To concentrate on Onward Still makes more sense. Only then you will notice the delicateness of the music, with the voice of Jane Willow up front. She has what I would call a typical U.K. folk voice. Made to carry a tune. Around her voice there are other instruments, of course, but they are there to carry the tune, they are in service of the song and the singer. A cello, drums, an acoustic guitar and a banjo. That may be just it. That makes a song like 'Hannah' such a surprise. Jane Willow lets out her R.E.M. side here. A banjo (or mandolin, I am not 100% sure) in a frolicking mood meanders through the song. It is mildly rocking, with a warm Hammond organ providing a finishing touch. 'Hannah' ought to be a hit on adult radio. The delicateness returns with a fragile song called 'If I Did Love You'. Jane Willow is even more delicate here. An extremely delicate song, in a way reminding me of Elenne May at its most delicate. With 'If I Did Love You' another highlight of Onward Still is reached. The kind of song that commands listening. The almost screeching violin creates a near dissonance. And then, out of nothing, a full band kicks in, total abandon, lifting the album up even more. Alas, it has been made clear by then, the person sung to is liked but not loved. 'Comfort' is the right title for the final song. In a Leonard Cohen style guitar playing comfort is provided to all. By then I have been convinced once again. 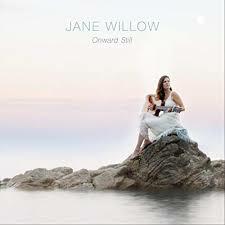 Jane Willow is a folk talent. It may be impossible to be unique any longer in this genre, it is possible to present the world beautiful songs and there are at least three on this six song album. It starts ably, it ends in a grand style.